Monday numbers: A closer look at murder and extremism in the U.S. 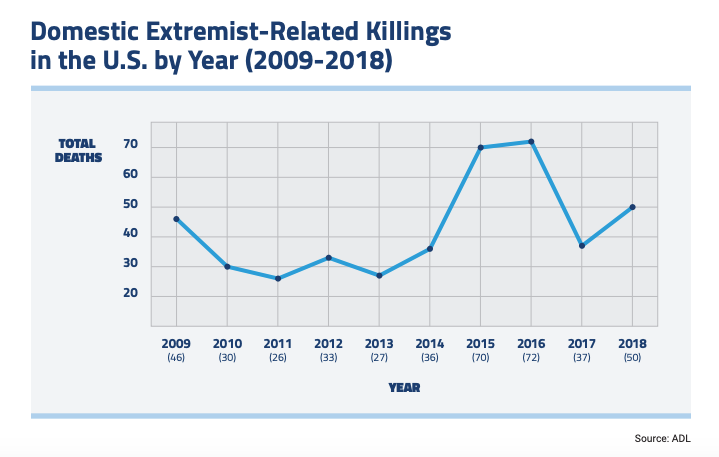 The Anti-Defamation League’s Center on Extremism has released its annual report on Murder and Extremism in the United States. The 2018 numbers show a sharp increase in murders by domestic extremists, especially right-wing groups. The ADL’s interactive Hate, Extremism, Antisemitism and Terror (HEAT) Map can be used to see reported incidents in specific geographic areas all over the U.S. This week we take a by-the-numbers look at this year’s report. 5 – the number of shooting sprees linked to extremists in 2018, a major factor in the surge of deaths in the new report.